We never get tired of "THE REVEAL"—that full-of-anticipation moment when we see after photos of one of our online interior design projects for the very first time. What makes a reveal in our world of online interior design particularly exciting is this: while it's our designers who create the room design and our team who does the product ordering, it's our customers who ultimately "put the room together"—based on the layout recommended by their Decorist designer—once everything has arrived. So our "ta da" moment happens virtually; it's through an emailed "after" pic or Instagram post that our designers get to see how their décor recommendations came to life. It's always exciting. Our "ta da" moment? Editor-in-Chief of PureWow Mary Kate McGrath's dining room reveal, which was also featured on PureWow. The title of their story? 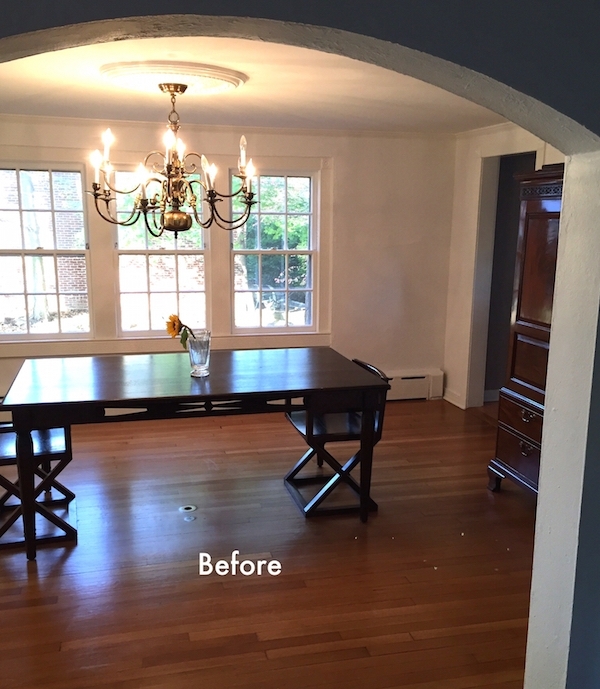 "You Won't Believe This Gorgeous Dining Room Transformation." We'll take it! Here's the scoop behind Mary Kate's dining room makeover—one which stylishly balances classic and modern décor elements. Let's start with the before: traditional, heavy on dark wood furniture, and pretty sparse. In terms of future direction, here's what Mary Kate shared with us in her design questionnaire (a first step in the Decorist online interior design process): "I want something light, airy and fresh. The opposite of the heavy wood dining rooms I grew up with. I love cooler colors—white, gray, pinks with blue undertones, and I like comfortable seats and furniture options that encourage sitting for a while." 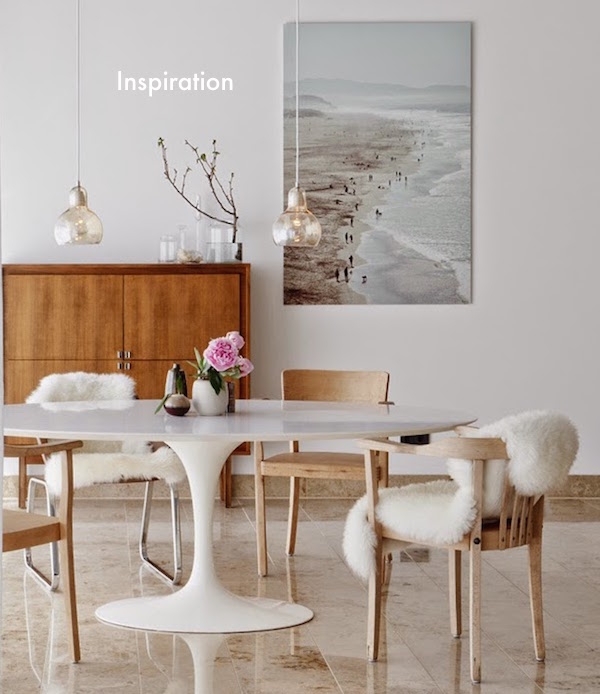 Mary Kate also uploaded the below inspiration photo: simple, yet full of light with a modern vibe. Inspiration photos are an important part of our design process as it helps us get to know our customer's style and better understand their vision for the room. Mary Kate chose to work with Elite designer Simone Howell, who shines when it comes to breathing new life into more traditional spaces. "I understood from my exchanges with Mary Kate that she wanted to evolve her dining room in a modern direction, while honoring the more classic architecture of her home," says Simone. "Through our conversations it became clear that the inspiration photo she shared was more aspirational than the décor direction she ultimately wanted to take. While she loved the idea of a white oval tulip table she already had a wood dining room table that she wanted to find a way to incorporate, ideally." The first design concept incorporates a neutral color palette with dashes of cool gray and pink and a healthy dose of pattern mixing. The collected feel of the dining chairs gives the room real character (with the pink wishbone chairs providing an unexpected pop of color). And given Mary Kate's desire for guests to gather and stay a while, Simone recommended a cozy banquette for one side of the table. 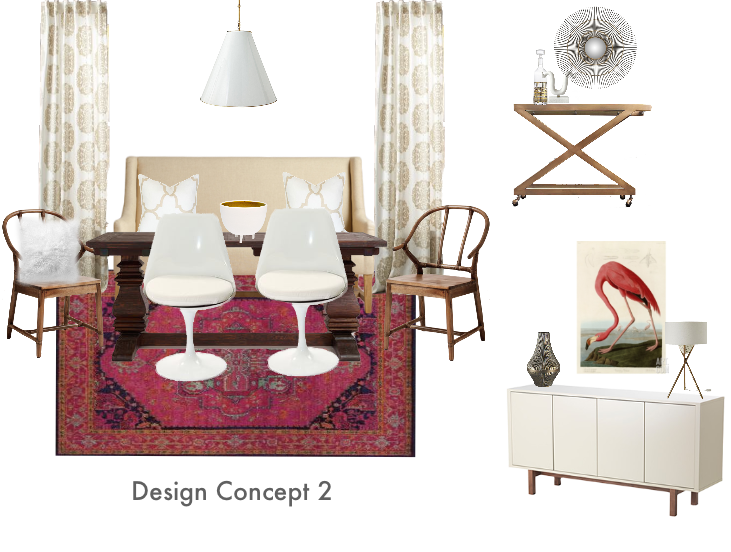 Like Concept One, Concept Two integrates classic and more modern pieces in a fresh way. The design revolves around a bold pink statement rug that 's a vibrant, current riff on the more classic oriental rug. Knowing that Mary Kate loved the idea of a tulip table, Simone recommended two tulip chairs in a fresh high gloss white (also great "stay-a-while" chairs as they have cushions), as well as a banquette and two wishbone chairs. By now you've surely figured out which design Mary Kate pursued... and you probably also noticed a few changes from the concept. Mary Kate loved Concept 2, but asked for a few chandelier options with an eye towards something with more bulbs (= more light!) and a more open feeling. Simone recommended the beautiful mid-century inspired brass and crystal chandelier, among a few other options. To amp up the brightness even further, Mary Kate removed the shades for a more simple, modern feel. Gorgeous in an understated way, right? Simone also recommended additional art option. 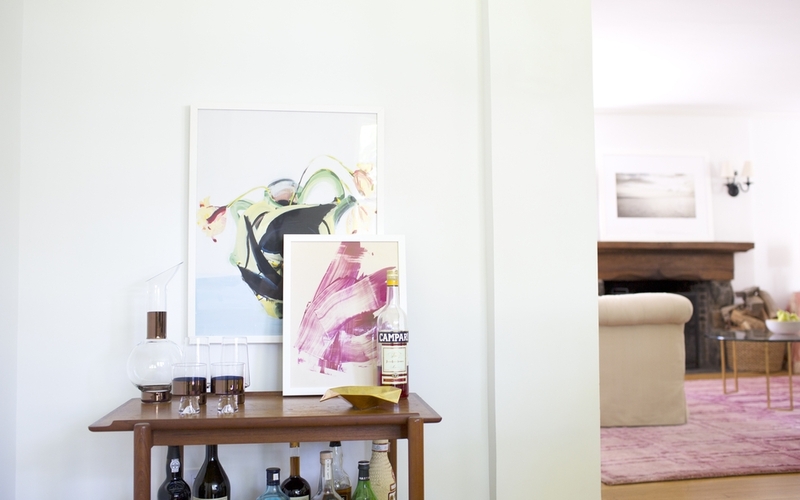 For Mary Kate's vintage wood bar cart, Simone suggested layering two abstract pieces. "There are so many great online sources for affordable art," says Simone. I found the simple pink abstract print on Artfully Walls; it echoes the colors in the rug perfectly and contributes to the modern part of the story of the dining room." Simone recommended that Mary Kate swap a larger, heavy console for smaller, more feminine demilune table which she already owned. 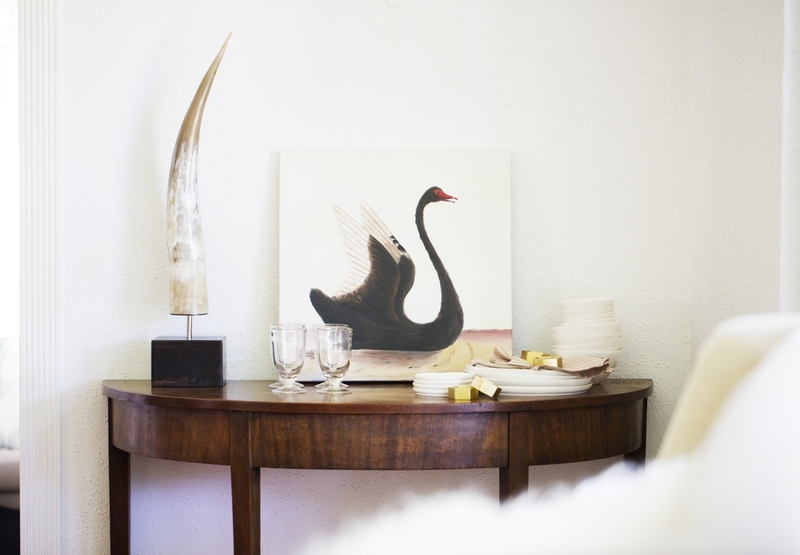 The styling is simple: a statement making horn objet and a dramatic black swan oil painting. Here's what Simone had to say when she saw the after photos for the first time: "I absolutely love how the dining room came together; it so perfectly illustrates how more classic, existing pieces can be combined with a few new pieces for a completely fresh, more modern look. You absolutely don't have to start over to feel like you have a new room. 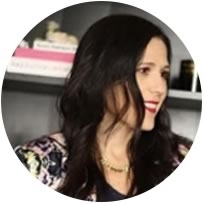 It's one of the things I love most about being an online interior designer; many of my Decorist design projects are about building an entirely new look around a few existing pieces." Have a room that needs a fresh perspective? 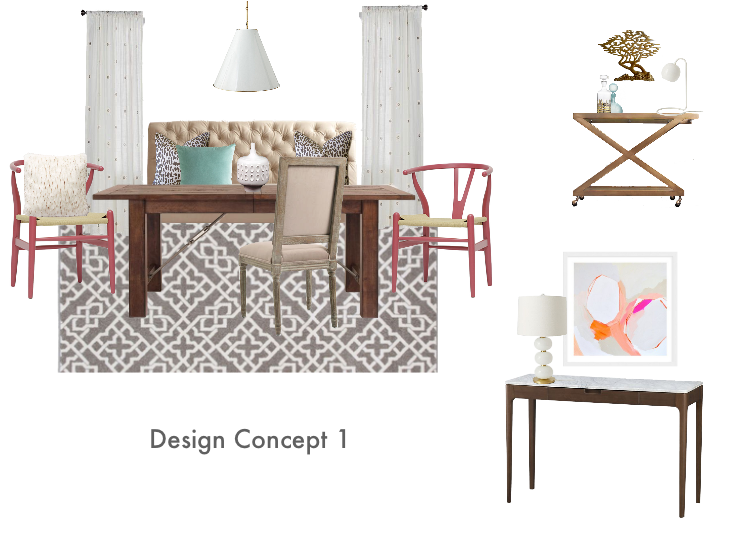 I'd love to help you start your online interior design project today!